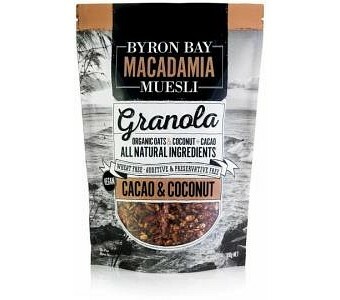 Byron Bay’s Macadamia Muesli line brings the bounty of biodynamic agriculture to your breakfast table with offerings like this Cacao & Coconut Granola. A rich and crunchy vegan blend of organic oats, nuts & seeds, organic cacao powder and organic coconut hand roasted with organic coconut syrup and blended with delicious goji berries and organic cacao nibs. High in monounsaturated fatty acids, antioxidants, and essential vitamins and minerals, it’s delicious on it's own as a snack and even better in a bowl of yogurt or milk! Ingredients: Organic Australian Oats, Organic Coconut, Organic Coconut Syrup, Sunflower kernels, Organic Pepitas, Organic Cacao Powder, Organic Cacao Nibs, Sesame Seeds, Macadamia Nuts, Spray Free Almonds, Goji Berries, Chia Seeds, Organic Flaxseed, Organic Coconut Oil, Cinnamon Spice.